Home / Needlework / Make your house original - decorate it with balls of Kusudam! Make your home an original - decorate his balls Kusudama! Origami has long been an important place in the JapaneseCulture. 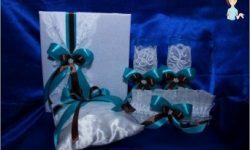 It is not just one of the varieties of needlework, it is the whole art of which many legends and legends are composed. 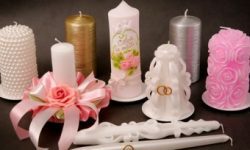 In the ancient Japanese believed that the figures made with the help of origami technique, create a positive atmosphere in the house, protect tenants from quarrels and quarrels, protect against diseases. Learning how to make figurines from paper in thisEveryone will be able to do the engineering, although it is necessary to recognize some figures rather difficult. Therefore, all who decided to understand this ancient art is best to start learning with simple figures. Kusudama for beginners will help to relax, calm nerves and at the same time decorate your home with a beautiful and unusual thing. There was an ancient tradition of creating theseAmazing balls in Japan hundreds of years ago. Most likely, originally for their manufacture, plant flowers were used, which filled the space with the fragrance of incense, protecting the house from misfortunes. 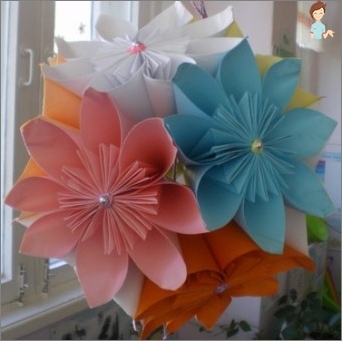 Later they began to make kusudams from paper inTechnique of origami and used as a home decoration. Currently, for many Europeans, the bowl of Kusudama in the house is an excellent fashionable decoration, an element of decor and an amulet. The Kusudam's ball is made of paper elements,Folded in a special way. The technique of their implementation implies the repeated folding of the paper in different directions. To impart strength to the structure, all elements are glued together with glue. If you decide to join the Japanese a littleCulture and want to learn how to make balls kusudama, the scheme should be chosen for beginners. It is best that this is a simple model that consists of a small number of paper modules, so that a quick success will please you and inspired you to create more complex masterpieces. The simplest figures of Kusudam in formMore like a cube, because Consist of only six modules. Schemes of these figures are understandable even for beginners. 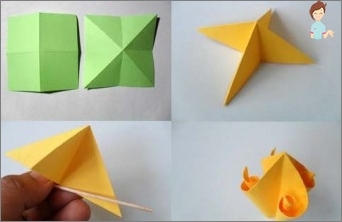 Many lovers of something to make their own hands begin to comprehend all the tricks of the technique of performing Kusudam origami with this simple form. First you need to prepare six squares of colored paper of the same size. All the sheets of paper must have the same density. Turn the module upwards «Bottom"- at the base of the figure there must be a square. Its corners need to be bent down as much as possible so that the module can later be glued together with the rest of the craft. Further, according to this scheme, we perform fabricationThe remaining five parts of the Kusudama. 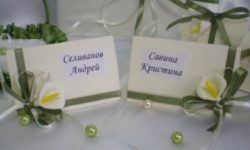 It is important that all the folds are performed as accurately and accurately as possible, otherwise the figure will come out as a kosobokoy. When all the elements are ready, you can start assembling. In order to firmly connect the six parts of the model with each other you will need glue. The modules are braced with corners inward. 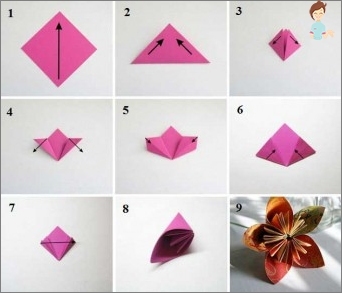 Learning to perform the simplest models, you canTry to fold the kusudama for beginners in the form of flowers. Schemes can be found on the Internet, and you can improvise and create your own scheme of figures!